Do you mind if i make a remix? You have my permission to make a remix, so long there's proper attribution! I played your game in a combo video I did. This was really fun to play! I Was Laggy But Great Job! That's so amazing! Really really though, that is quite the feat, truly insane and awesome. I'm pretty sure I've never come close to doing that. Love it so much!!!!! Beat normal mode and have almost beat hard mode!!! I composed the music and don't exactly have a name in mind for it... maybe Just One Song? Cute little game! Wanted to try out a boss rush/boss fight centered game for some inspiration! very fun. Vey cool game with a clever way to increase difficulty ! brilliant ! I also really love the boss design as well, it really keeps the game fresh and interesting considering the fact that a "one boss boss-rush" as a concept has a high risk of becoming either repetitive or too short. Even though gathering the glowing tiles technically makes him more difficult to beat (which as a player I should be conditioned not to do), I honestly didn't even mind because I was always excited to see what new attack would get thrown at me next. Really fun game!! That was insane... didnt expect to play it but hey i enjoyed it NOICE! Hey, how do you dodge the card attack when there's two of him? This was fun, and I found it fairly unique. Thanks! The movement blur is Xtra juicy. Dope boss. Quality gameplay. I could go on and on about how good this is. What a challenging but rewarding game! You might think it's easy with a name like "Just One Boss" but don't be fooled! Bridgs took time and effort into making this game for all of us, and the quality definitely shows in a fun yet difficult way. :) I was able to beat normal and hard mode in just a little over an hour, so if you're stuck or having issues, feel free to watch what I did in my playthrough of it. I show you how to dodge all of his attacks in all his phases (both for normal and hard) and explain it as well, so hopefully everyone will have the tools and strategy they need to beat it now! Thank you Bridgs for making this, and I look forward to playing your other games, too. 10/10! Loving this game! A nice change would be that when the two character part kicks in, you're allowed to "swap sides" just so your controls make sense in your head! This game is so perfect, you're an absolute genius. P.S. if I HAD to complain, I'd say normal mode should be way easier just so everyone can beat it. Hard mode, of course, should be for those who stick around after beating it. Awesome game! Normal mode alone was tough, but hard mode left me gaping. Took awhile, but beat both! Whoa! This game is incredibly fun, original, and a really nice challenge. I had a great time playing it and I hope you keep making more games like this one. I can't wait to see what you do next! This game is amazing! Super fun and simple idea that is very challanging! The music has been stuck in my head for a few days now after playing this and it fits the game perfectly! Awesome game! glad i played it, hard mode was pretty tough but i beat after like 20 min, anyway hope you make more games! Already the music got me hooked into the battle as the classy 8-bit music icked in. I found myself constantly smiling as Wizmirror (That's the name I gave him) tried to impale me with flowers, cloned me (I died a lot there), and fired lasers at me. If this was a real game, then HOLY HELL I would play it until my computer ran out of battery! Extra thanks for not giving a piss about graphics and the music! Can I download the OST if possible? Edit: I really hope this game stays free! Oh, also, do you plan to make this a full boss rush-esque game? I'd love to see that! Edit 2: I'm finding myself trying to find a game engine trying to recreate this cool game! What software did you use to make this music? Hehe Wizmirror, I like that! 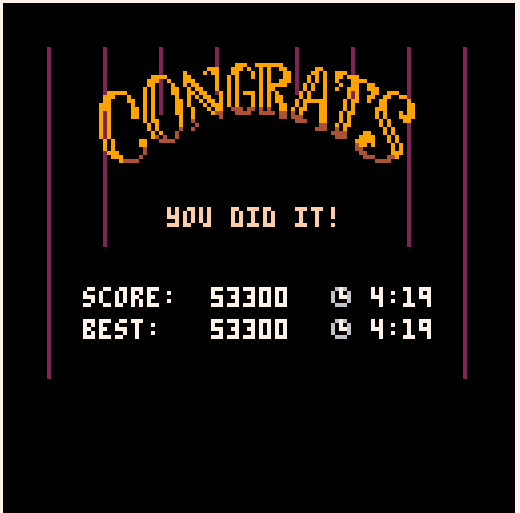 The game was made in PICO-8. It's a great engine to get started in game development, and if you're interested I'm working on a tutorial series to help people learn PICO-8. The music was created in the chiptune editor that comes with PICO-8, which I found to be pretty accessible! You can even download Just One Boss and export the music to a .wav file really easily. I love boss fights and I have a dream of making a full boss rush at some point in my life, but it probably won't be with this set of mechanics (though I do think these mechanics have a lot of interesting design space to offer). No sounds if you play in Chrome? Hey, wanna say that though this boss beat the hell out of me for the first few minutes of playing (and still stuck on Hard Mode), it felt like a really good boss to fight against, and definitely memorable. As a dev/spriter of a video game mod that focuses on making difficult but fun bosses, I found myself falling in love with this game. I showed this to some other familiars and they also found it pretty neat, and of course they got to Hard Mode and got their arse beaten. They all enjoyed it though, and I'm hoping this gets more attention. Made a little sketch as appreciation for your work! Thank you so much! There is a game on armor games called 'floor of hell' that is a carbon copy of this game. Thanks for letting me know. I contacted the author a couple days ago, but ultimately I'm comfortable with the existence of this game. Just One Boss is released un a creative commons license, so it's free game if people want to remake or riff on it.